Komodo National Park is home to over 90% of the world’s marine life and species and is named a UNESCO World Heritage Listed Natural Site. Trash Hero Komodo is a local team determined to maintain the pristine waters and environment of Komodo for people to enjoy for years to come. Increased tourism can come at a price but with great support from amazing local people and the wider community, the impact of increased visitors on the ecosystem of Komodo is being reduced. 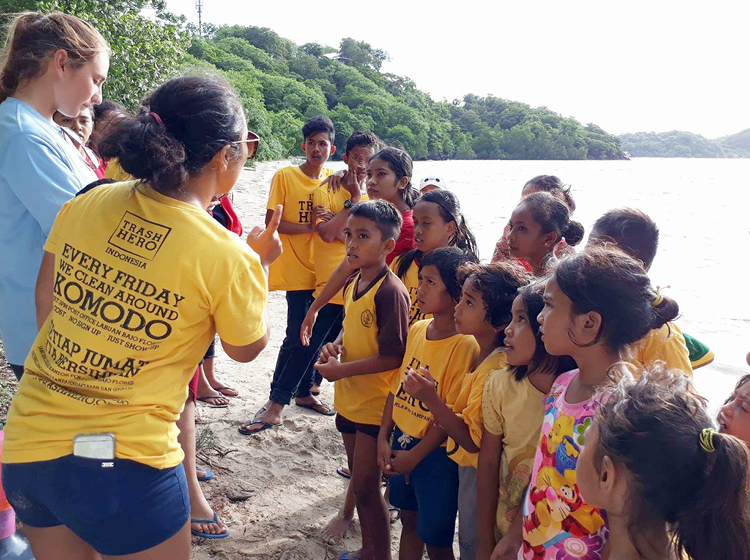 Fia is a representative of the hard-working Trash Hero chapter in Komodo and while she is incredibly busy with environment projects and education programs, we were able to steal some of her time and interview her on the work being done on Komodo. How long has Trash Hero been active in Flores and Komodo and how many fabulous team members do you have? Trash Hero Komodo started in Labuan Bajo town in June 2015, but for over a year now we also have teams doing great work in Warloka Village and Punggu Island. Now, Trash Hero is expanding into Flores Island; we already have Trash Hero Ruteng and Trash Hero Maumere while several more locations are requesting to start up. There is no 'membership'; some people come almost every week while others join when they can. There are around 12 people that lead most events, and we welcome more people to take organisational roles. In total for all cleanups we have had 4117 people joining (adding total number of heroes at each cleanup). Can anyone join in your cleanups and how often do you have them? Trash Hero is an open movement that welcomes anyone who wants to be a hero. Our cleanups usually have between 20-70 people, many of whom are kids. We also work together and overlap with other organisations on our cleanups including P2L (women’s group), P2LB (youth group), MantaWatch, Marine Megafauna Foundation, DOCK and more. We do not require any registration, just come along! We meet at the same place every Friday at 3pm and then head to the targeted area together (see map). We have already done 180 cleanups. 180 cleanups is a massive task – congratulations are in order. It’s not glamorous work but it is so essential for maintaining and protecting the environment. In your opinion, what's the biggest environmental risk to Flores and Komodo? I believe that the biggest risk is low awareness amongst both residents and visitors about what plastic is and what it does to our environment. Many visitors are used to recycling systems back home that are not developed here. What we put in the public bin here will go to the landfill and be burned in the open, causing toxic fumes. But there is also a big misconception by many people worldwide that recycling makes it ok to keep using plastics. The truth is that recycling is better than dumping/burning but the recycling process is still harmful to the environment. What we all need to do, in Komodo area and globally, is to reduce the use of unnecessary plastics. That’s a good point. I live in Bali and the same can be said, whatever rubbish goes into a bin, goes either into burning pits causing toxic fumes or straight into the ground where it takes a frighteningly long time to even start decomposing. What can visitors to the area do to help? Yes that is unfortunately the reality in many areas globally and often the general public is unaware of this. And come to join our cleanups and other activities. Please contact us if you want to get involved more. Great advice again! There are so many alternatives to plastic straws now; bamboo, glass, paper, metal. Or just do what you do at home and don’t use a straw at all. What ongoing programs do you have and what are the long-term goals? The Trash Hero Kids book came out earlier this year, it contains a beautiful story about a boy called 'Trash Hero'. It also contains important facts and a progress chart where kids can earn points by using good behaviour such as joining cleanups and saying no to plastic straws. Trash Hero Indonesia/Thailand are now trialing this in many locations and forming a lesson plan around the book. Together with some fellow local movements we are getting access to an old house in town later this year. The plan is to paint and decorate it together and then use it for various activities including kids education, film nights, eco brick making, community workshops and much more. We will continue to supply local businesses with high quality drinking bottles that they can sell for a small profit, in return they offer public water refill stations. We have already supplied 1650 bottles and have 36 water stations in place. This program is running alongside and overlapping with a similar program by the Tourism DMO. We are looking forward to getting our yellow shopping bags on the market later this year. Like the bottle program the main purpose is to reduce single-use plastics and we never make any profit on any of our programs and activities. If you could guess, how much rubbish do you think you have collected and where do you mostly find it? Actually I can tell you exactly because we always weigh our collected trash, it is a way for us to measure our success. Trash Hero Komodo has to date collected 28,888Kg trash of which 39% was recycled. We only clean local areas, mostly on beaches. Beaches are not only used as a dumping area but there is also a lot of trash floating in with the tide. This comes from boats, the harbour, coastal villages and also from inland via rivers. Just under 29,000Kg of trash!! Considering how light each piece of plastic trash actually is, that is an incredible amount of waste collected. In an ideal world, if you could choose three things that would help keep Flores clean and beautiful, what would they be? Have you seen public awareness about the protection of the environment change? Yes I have seen a change due to the great work of many local organisations combined such as Eco-Flores, IWP, WWF and the ones already mentioned! What are the key messages you would like us to make our readers aware of? That everyone can make a difference and every action is important; many drops make an ocean.